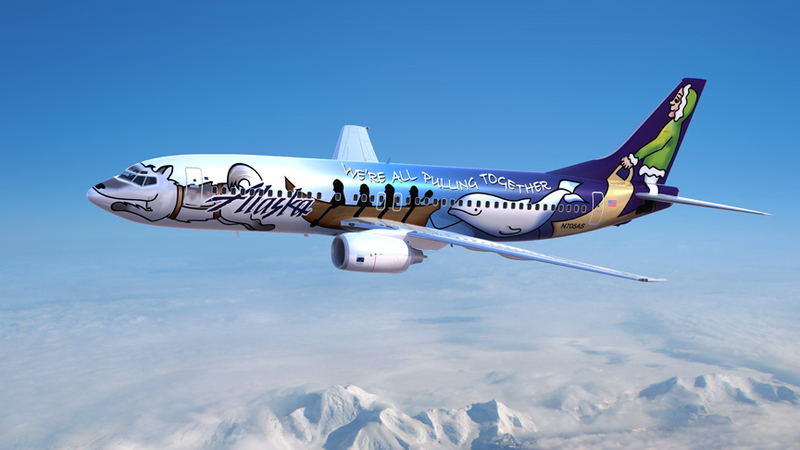 When Alaskans celebrated 50 years of statehood in 2009, Alaska Airlines decided to honor its namesake state by painting a special Alaska-themed paint theme on a Boeing 737-400. But with a state so vast and unique, the company had difficulty coming up with a design that was inclusive of everything from the ice in the Arctic to the tundra in the Interior to the rainforest in Southeast. 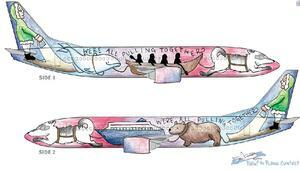 In August 2008, Alaska Airlines launched a statewide “Paint the Plane” contest, in which schoolchildren from Ketchikan to Barrow submitted their designs for the plane’s new paint job. Ultimately, a panel of Alaska artists, former governors and other prominent Alaska leaders selected a design by Hannah Hamberg, a 16-year-old student at Sitka High School. Hamberg’s design features a musher and sled dog, state ferry, canoe, bear and whale. All of these elements, representative of the entire state of Alaska, come together under the statement, “We’re all pulling together.” The plane was publicly debuted in April 2009. Prior to working for Alaska Airlines, Romano judged the “Paint the Plane” contest and recalled seeing Hamberg’s design when it was a sketch on an 8.5 by 11 inch piece of paper. Now, seven years later, the plane deemed the “Spirit of Alaska Statehood” has officially retired. The plane made its final flight on Thursday, June 16, carrying passengers from Sitka to Seattle. Hamberg has since graduated from college in the Lower 48 and returned to Sitka to work as a graphic designer for the local newspaper. Hamberg and her family were at the airport on Thursday, to bid farewell to her plane as it left the state of Alaska for the last time. While in service, the “Spirit of Alaska Statehood” completed 31,533 flights and flew a total of 55,382.6 hours. All week the plane flew most of its final segments within the state of Alaska, stopping in Kotzebue, Nome, Bethel, Fairbanks, Anchorage, Juneau, Ketchikan, Wrangell, Petersburg, and finally making its final flight from Sitka to Seattle. Alaskans from all over the state shared their favorite “Spirit of Alaska Statehood” memories on the Club 49 Facebook page as the plane embarked on its farewell tour. Comments summarized the great deal of pride and passion Alaskans feel for their state and this special plane. Now the plane will head to a heavy maintenance facility, where it will be repainted a generic color and returned to its pre-lease state before officially leaving the Alaska Airlines fleet. 5 comments on "Alaska Airlines’ beloved ‘Spirit of Alaska Statehood’ airplane officially retires"
Not mentioned in the article, but this beauty also visited Kodiak on June 11th, in her final days within the State of Alaska. Little did I know I was so lucky to be on that flight! Flew on it a couple of times during its time. People always talked about it waiting to get on the plane. Good job Alaska and thanks. I was there in Statehood year. Never forget, it was a big deal. I still have two of the Alaska Dollar Coins. Use the out line of the state. color white where the arctic circle is. We were never able to see this lovely symbol of Alaska??? ?, but it’s a beautiful thing for the airline to have done??? ?